Anytime I've taken a trip to another city for a jazz festival, there is usually one performance that makes me think I have become fully immersed in the whole event, or it makes something go off in my head that says, "This is the reason you came here." That voice starting screaming enthusiastically upon seeing Mike Reed's Flesh & Bone at Winter Jazz Fest back in January. In the relatively intimate confines of the Glass Box Theater on the campus of the New School, drummer Reed's sextet played an intense set that was rhythmically straight forward with plenty of drive and room for four horns to go wild or calm down as the mood called for it. Marvin Tate stood silent throughout most of the set, but during a few transitions in the music, he added some pointed spoken word passages to the proceedings. Normally on the fence about this blend of disciplines because of the way the delivery can upset the flow, I walked away thinking, "I wish they used him more. That really added to the intensity." Speaking of intensity, I concluded my notes from that show with the scribble, "This is like Mingus, turbo-charged." But the music they played that night, which appears on the Flesh and Bone album, has a back story. 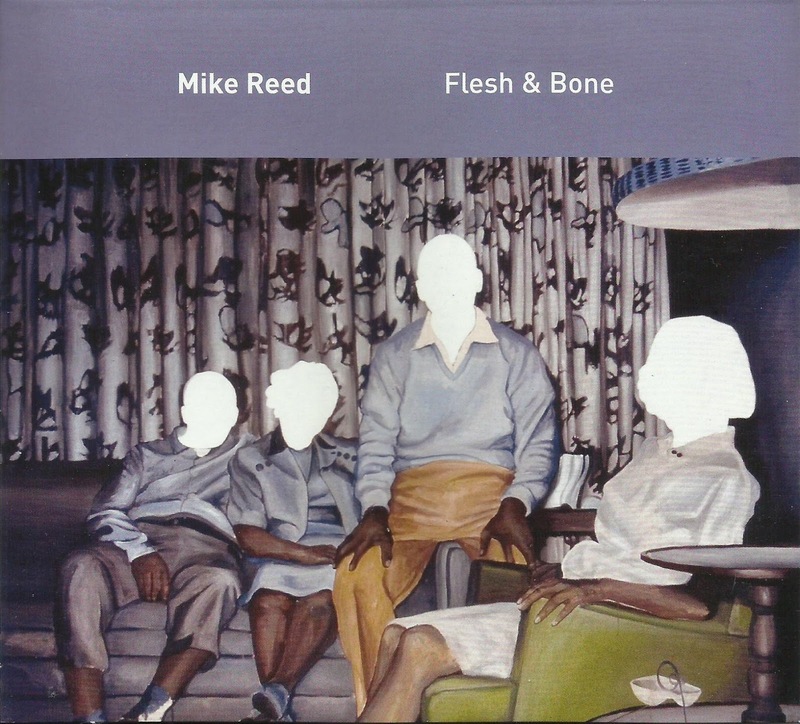 In 2009 Reed was touring Europe with his People, Places and Things quartet (with alto saxophonist Greg Ward, bassist Jason Roebke and tenor saxophonist Tim Haldeman, who all appear here). Traveling by train from the Czech Republic to Krakow, Poland, a conductor told them they needed to transfer trains in the Czech city of Prevov. It turned out to be wrong information which the conductor intentionally told them, because it put the band (which included two African-Americans) right in the middle of neo-Nazi rally that had been planned for that afternoon. For several hours, the quartet was trapped in the train station, fearing for their safety, before a stranger found some riot police to help them. Flesh and Bone doesn't try to chronicle the event specifically through its 11 tracks. (At the Glass Box Theater, there was no mention made of it at the show itself.) But it does have a sense of urgency and fire that runs through it, even in the tender sections. In addition to Reed's PP&P members, the group features bass clarinetist Jason Stein and trumpeter Ben Lamar Gay. Back in January, I scribbled that Gay "just swore at us" with horn, after a particularly biting moment in "Conversation Music." He doesn't quite do that on this version, but this track offers plenty of dynamics during an opening section where Stein gurgles and grumbles and the rest of the horns play a minor riff behind him. This title comes from the term Duke Ellington used for music he once played, which allowed people to talk over it. In this case, the conversation takes a more ominous turn. By the end, Ward and Stein are weaving countermelodies around each other, not sounding sinister but still intriguing. Along with the frenzy of "My Imaginary Friend," with a climax that gets some great screams from all the horns, Reed gets more subdued in the folk-like "Watching the Boats." He sits this one out, but Roebke makes an opening statement before he laying the groundwork for the horns to co-mingle. Tate raises the intensity of the whole performance, with long, vivid imagery that might not fully register on the first or second listen. Like the music, each new listen illuminates more of his points. His assessment of how "freedom" is spelled backwards ("Call of Tomorrow [My Life Up Until the Present]") is mandatory listening. "Scenes From the Next Life" ends the album with a sound collage of bass playing (by Reed) and disembodied voices. It doesn't so much wrap up the album as simply bring it to an end. But after all that came before, and the subject, it's appropriate. Flesh and Bone would have been considered an important album regardless, for both the powerful interactions of the musicians, the events that led to its creation and what it says about the state of the world. (For years, the common thought was that jazz musicians were treated better in Europe than they were in the States.) At Winter Jazz Fest, everyone was thinking about the way art reflects on life, and there almost seemed to be a heavy uncertainty for what the future might hold. In the last month, things have gotten even more divisive with the events in Charlottesville, Virginia. Now, it feels like the album feels has taken on a greater significance, serving as a reminder that there is more we need to do.